Copper encourages the absorption and utilisation of zinc into the body. Copper activates a variety of enzymes essential to energy metabolism. 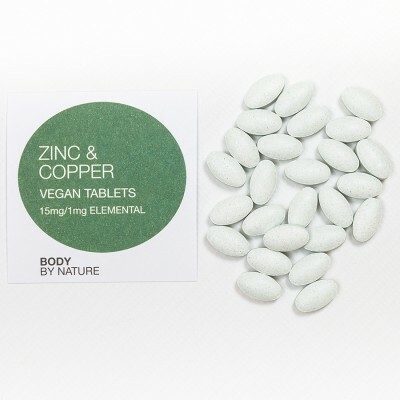 Food State Zinc and Copper enters the body in a pro-biotic complex, therefore is a gentle and easily absorbed supplement complete with amino acids and nutrient carriers from the accompanying pro-biotic culture. A Food State supplement - uniquely provides nutrients in the same form as those in food. Suitable for Men, Women, Children and the Elderly. Yeast free and suitable for vegetarians also for people with Candida and Yeast sensitivities. Free from Genetically Modified Substances, Zinc coupled with copper will prevent the risk of possible deficiency over a longer period of time. Normal protein synthesis. Zinc also contributes to normal cognitive function, Contributes to normal carbohydrate and macronutrient metabolism, Contributes to a normal function of the immune system. Copper helps with the production of collagen, a vital component of connective tissues and bones. Protects cell constitutes from oxidative damage. Zinc deficiency is very common in vegetarian diets, so it can be beneficial for Vegetarians. A key antioxidant mineral for maintaining the immune system. Adds to both normal metabolism of fatty acids and acid-base metabolisms. Impacts on the normal cognitive function. Copper can help to treat osteoporosis and bone loss. Aids with normal fertility and reproduction. Helps with normal metabolism of fatty acids and normal acid-base metabolism. This particular supplement is combined in a base of friendly pro-biotic species called lactobacillus bulgaricus which is a native inhabitant of the human tract. The benefits to this supplement are; Extremely low allergy risk due to this pro-biotic fitting into the normal metabolic pathways Neutral taste as well as smell. Inactive Lactobacillus bulgaricus combined with zinc citrate and copper sulphate, microcrystalline cellulose, vegetable stearic acid. Yeast, wheat; starch; gluten; soy; added sugars, colourings, flavourings & preservatives.